A checklist that flew on NASA's 1970 Apollo 13 moon mission drew more than a dozen deep-pocketed collectors into a bidding war on Wednesday (Nov. 30), rocketing the final sale price into the six figures. As the prices paid for items like the checklist have risen over the past few years and as space history enthusiasts have increasingly chased after a dwindling supply of early NASA artifacts, the U.S. space agency has been keeping an ever closer eye on the collector's market to ensure that the items being sold are not government property. The winning bidder for Apollo 13 commander Jim Lovell's Lunar Module Activation Checklist, whom Heritage Auction Galleries identified only as an "east coast collector," need not be worried about his or her $388,375 purchase. The flown 70-page, ring-bound book was sourced directly from the astronaut's personal collection and falls into a class of mission-used equipment that crew members were allowed to keep as souvenirs. The item was made famous by the 1995 movie adaptation of the mission starring Tom Hanks. The Apollo 13 checklist was among more than 200 space artifacts auctioned by Heritage on Wednesday during its ninth dedicated space-themed sale since 2007. At the end of the day, the auction brought in nearly $1 million for the Dallas, Texas gallery and its consignors. 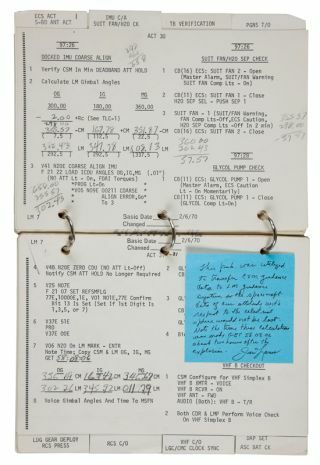 Lovell's notebook, which accounted for nearly one-third of the sale's total take, was used by the Apollo 13 astronaut to guide him through the steps necessary to power up the lunar module, Aquarius. Under the original flight plan, Lovell would have used the checklist to prepare the spacecraft for later landing on the moon, but after an explosion tore apart the service module and crippled the command module Odyssey, the checklist was needed to quickly adapt Aquarius to be a lifeboat for the crew to return to Earth. The same checklist — in prop form — featured prominently during a scene in the Ron Howard film "Apollo 13." Actor Tom Hanks, portraying Lovell, used a page in the book to convert Odyssey's guidance data so it could be entered into Aquarius' computer. Meanwhile, flight controllers back in Mission Control were shown using slide rules to "double check" his arithmetic (a request that Lovell radioed down during the actual mission, too). "We've got negative visibility in our star field" Hanks, as Lovell, says, "and if this paperwork isn't right, who knows where we'll end up out here." The real Lovell, who with crewmates Fred Haise and Jack Swigert ultimately ended up safe back on Earth, said that he found the checklist while cleaning out a bookshelf after he had already donated many of his mission souvenirs to museums and given other items to his children. "I decided to put this up for auction so that someone who is really interested in this piece of history can enjoy it," he told Reuters. The winning $325,000 bid (the additional $63,375 was the auction house's commission fee) exceeded the checklist's pre-auction estimate of $25,000 by more than 15 times. Other flown checklists from other missions — including Apollo 11, the first lunar landing — have sold in the past for six figures, but this may be most ever paid for one of these in-flight documents. Other highlights from Heritage's auction included a camera grip that Apollo 9 lunar module pilot Rusty Schweickart used during his spacewalk ($26,290) and a training glove worn by Alan Shepard, the first American in space, during his preparation for commanding Apollo 14 ($19,120). Neither item's — nor any of this auction's other items' — ownership was reported as challenged by NASA, which allowed the sale to go forward. The agency, or more specifically its Office of Inspector General (OIG), will and has intervened if it believes that the artifacts being offered are still NASA property. In recent months, OIG agents have halted the sale of small samples of moon dust and began a lawsuit against Shepard's Apollo 14 crewmate Edgar Mitchell to reclaim a moon-flown camera that he was set to sell for upwards of $80,000. Mitchell settled that case out of court, returning the flown camera so it could be donated for display at the National Air and Space Museum. On Wednesday, Mitchell instead sold one of his flown U.S. flags for $65,725. Whether a NASA artifact can be sold, or is seized, often depends on whether the seller can clearly establish title. The flags that were carried aboard Apollo 14 and the other moon missions were manifested as part of the astronauts' personal preference kits, which were packed with the crew members' mementos. In the case of the RL-10 engine listed on the auction site eBay, the seller reportedly told investigators that he purchased it from an individual who had received it from "an unknown NASA employee." Without documentation that the engine was released from NASA property, the OIG recovered the artifact. In a another recently-reported case, agents recovered the employee badges that were issued to Apollo 1 astronauts Virgil I. "Gus" Grissom, Edward H. White, and Roger B. Chaffee, who died on January 27, 1967 when a fire broke out during a test on the launch pad. The I.D. cards were set to be auctioned for $20,000 to $30,000. The OIG investigation found that a former deputy chief of security at NASA's Kennedy Space Center concealed his possession of the badges for 44 years.